At least the utterly tasteless musical play Springtime for Hitler, from Mel Brooks's 1968 film The Producers, was a satire. But stand aside Mel Brooks, because Charles Manson: The Musical, which explores the life of Manson "the failed musician", has just opened at the Thalia Theatre in Hamburg. The 79-year-old cult leader remains in jail for life after being found guilty of conspiracy to commit the murders of seven people, among them the actress Sharon Tate, wife of the director Roman Polanski. Charles Manson: Summer of Hate – The Musical is described as "a musical trip between LA and Death Valley", and has songs in English and dialogue in German. The show is directed by 39-year-old playwright Stefan Pucher – who graduated in American Studies at the University of Frankfurt – and is co-written by Pucher with Christopher Uhe and Susanne Meister. It also focuses on the followers of Manson, known as the Family. At its height, the Family numbered around 30 people: runaways, drug casualties and deluded idealists. There have been albums of Manson's songs before and various musicians, including Guns N' Roses and Marilyn Manson (whose stage name was chosen with the cult leader in mind), have covered his songs. As well as songs and monologues from Manson (who is played by Jörg Pohl), there are recordings of Manson talking, video recordings of his followers and photographs of his drug-fuelled exploits in the Sixties. The theatre says the play explores Manson "the failed musician", who courted musicians such as Neil Young and Dennis Wilson of the Beach Boys. Manson seems to be in vogue again. 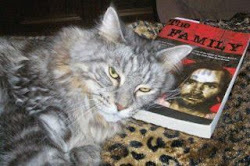 Roxwell Films recently announced that they had bought the rights to Ed Sanders’ 1971 book The Family, which described Manson’s life leading to the notorious 1969 murders. The book will be adapted for cinema by Guinevere Turner, who co-wrote the film adaptation of Bret Easton Ellis’s novel American Psycho. Die fuehrer würde jemand übergeben. As Jerry Seinfeld said, there's the formal "Sieg Heil" and the casual "Heil". "Heil, how are ya? Whose donuts are those?" A memo dated 23 July 1934 sent to local police stations stated: "There have been reports of traveling vaudeville performers training their monkeys to give the German Greeting....see to it that said animals are destroyed.